This Sun Peaks Links page is part of building a comprehensive and useful website all about the Best Sun Peaks accommodation, tours, activities, attractions, restaurants and services operating at or near Sun Peaks Resort - Canada's #1 Family Friendly ski resort. Please contact us if you are interested in exchanging links, promoting your Sun Peaks product or service, or advertising/sponsoring a page. With your help, we will make this the best and most useful website possible! Sun Peaks Resort - main website all about Sun Peaks Resort, lift pass purchases, webcams, etc. Best Sun Peaks Condo in the popular Stone's Throw Sun Peaks development - our beautiful executive and family-friendly condo with two bedrooms plus a private loft, 2 full bathrooms and easy ski-in/ski-out right behind the building. 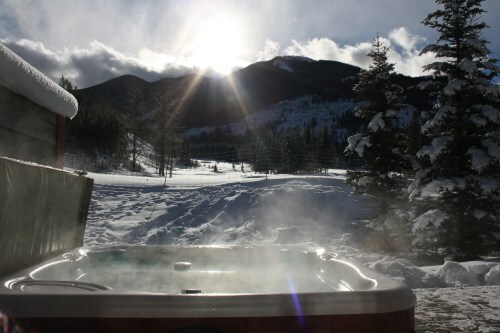 Don't forget the private hot tub with beautiful views! We do our best to ensure this is a perfect home-away-from-home ski condo at Sun Peaks. 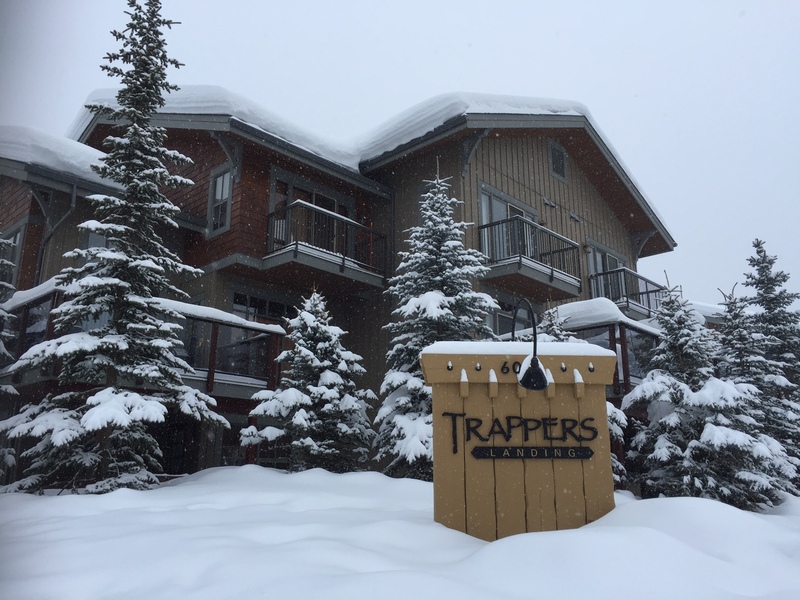 Best Sun Peaks Townhouse in the popular Trapper's Landing development - our luxurious, executive and family-friendly townhouse with five bedrooms plus a 2nd kitchen, 3.5 bathrooms and easy ski-in/ski-out right behind the building. 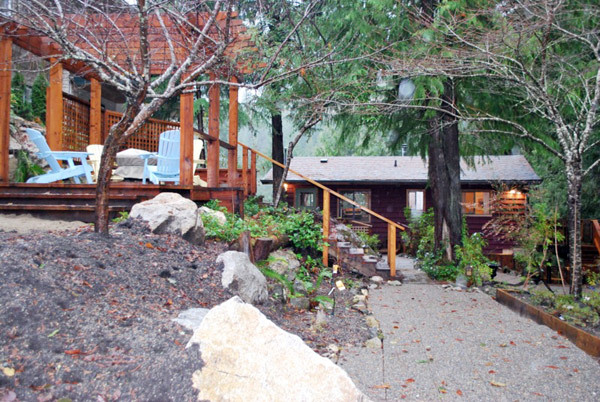 Don't forget the private hot tub, as well as a large patio with beautiful views and a BBQ! We do our best to ensure this is a perfect home-away-from-home ski townhouse at Sun Peaks. Sun Peaks Vacation Rentals By Owner - book these Sun Peaks condos, townhouses and chalets direct from the owners to get the best rates and avoid paying any booking fees. Discounted rates on Sun Peaks condos, townhouses and chalets from Top of the Mountain Accommodations. Sun Peaks Winery tours with Divine Tours - specializing in full service craft beer tours or wine tasting tours for 4-40 people from Kamloops to the beautiful Okanagan Valley and beyond, including their popular Sun Peaks Wineries and Waterfall tours. Pick-ups from Sun Peaks available. Custom Sun Peaks and Kamloops area, as well as other Okanagan winery tours with Tastefull Excursions in luxurious Mercedes touring vans. Large windows for sightseeing, comfortable and spacious for up to 11 passengers in each of their tour vehicles. They also now operate the Sun Peaks external Shuttle Bus Service. Tailgate Tours - offering various Kamloops area tour options including walking, hiking, sightseeing and wildlife viewing, and visiting local attractions such as wineries, craft breweries, the Kamloops Wildlife Park or even standup paddleboarding tours. 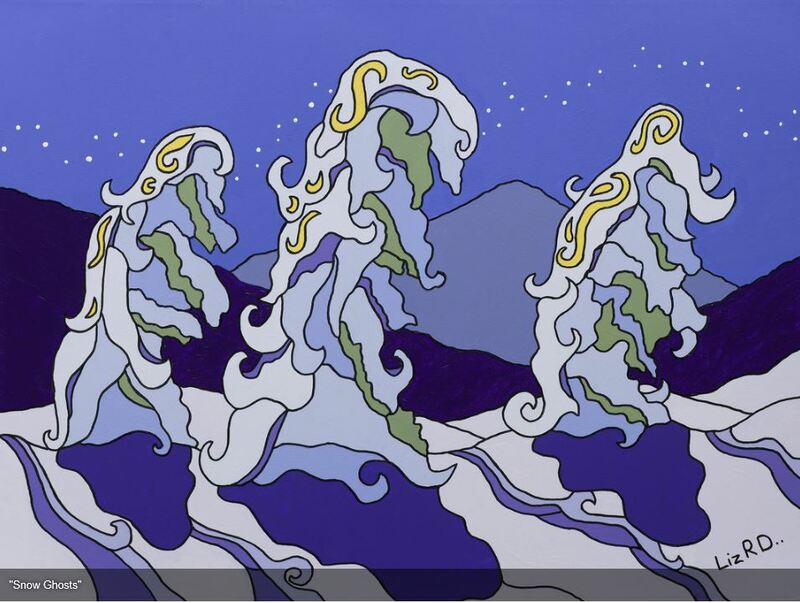 Liz Derksen - Liz is a local Sun Peaks artist who uses mainly acrylic and ink in her bright and colourful paintings. Her love of trees and all of the surrounding nature at Sun Peaks inspires her work. Liz also puts together Sun Peaks Paint Nights - join in and have some creative fun! Tod Mountain Café - great food and coffee available all day long - famous for their delicious savory and sweet crépes, wraps, burritos, breakfast muffins, panini, bagels, croissants and tasty hot lunches such as baked potatoes/yams, homemade chili, curry and soup, plus various homemade fresh and hot lunch specials of the day, along with cakes, cookies and other treats. Their coffee is organic, locally roasted fair-trade coffee, and they also sell healthy 100% fruit or vegetable smoothies with boosters too, and they offer gluten free, vegan and options. Located in the Hearthstone Lodge. Vertical Café - is a a small cafe at the base of Sun Peaks resort! They serve local, organic and fair trade Cherry Hill coffee and a wide assortment of healthy and fresh menu items such as fresh made paninis, wraps, quesadillas, vegetarian chili and hotdogs as well as specialty coffees, smoothies and shakes. Their breakfast features are served all day and their soup is made fresh every morning. Take a custom sandwich out on the go or enjoy a homemade cinnamon bun in the small but cozy café. Gluten free options are available. Free laptop access, free WIFI. Open Monday to Saturday 7:00am to 6:00pm and Sunday 7:00am to 4:00pm. Located in the Coast Sundance Lodge. Sun Peaks 50 Plus - connecting seniors and their families with other groups, services and events in and around Sun Peaks. Sun Peaks Adaptive Sports - a non-profit organization whose focus is to provide opportunities for people with a wide range of disabilities to participate in adaptive snow sports and recreation programs at Sun Peaks Resort. Sun Peaks Employment Opportunities - a list of current opportunities for employment at Sun Peaks Resort with 'View Details' links for more information about the position and to submit an application. Sun Peaks Fire Rescue - is a composite fire department staffed by three full-time officers and 20 very hard working volunteers. Sun Peaks Health Centre - Sun Peaks Health Association, a registered charity, provides medical and health services to the community. Sun Peaks Independent News - independently owned local newspaper published every 4th Friday. Sun Peaks Nordic Ski Club - established in the spring of 2013 to promote and encourage the participation in the sport of cross country skiing. Sun Peaks Racers - to promote alpine sports as a healthy and enjoyable activity for persons of all ages and abilities. Sun Peaks Skate Park Foundation - is a B.C. registered Non-Profit Foundation with the sole mandate of designing, building and maintaining a high quality free use skate park within the municipal boundary of the Sun Peaks Mountain Resort Municipality. Art Zone Sun Peaks - a non-profit organization whose purpose is to stimulate, encourage, educate, support and develop artistic and cultural projects and activities in the Sun Peaks Region. Sun Peaks Utilities - Sun Peaks Utilities Co. provides water, sewer and gas service to the community of Sun Peaks Resort, B.C. Black Beaver Crossfit - providing the Sun Peaks community with fitness training based on the fundamentals of CrossFit methodologies. Gym services, trail running group sessions as well as personalized training by popular local and trainer, Jase. Bluebird Market - only grocery/convenience store at Sun peaks, featuring products from local butchers, dairy farmers and bakery shops. From brand name snacks to freshly prepared deli sandwiches, they seem to have a little bit of everything. Care Fasken Yoga - Care offers a variety of Yoga classes throughout Sun Peaks and nearby Whitecroft and Heffley Creek locations currently, since Sun Peaks does not yet have a permanent Yoga Studio. She strives to promote an inclusive environment for each and every person, and truly does care for each person she meets. Check her website for classes, times and locations. Meranti Developments - Multiple award winning builder of custom homes at Sun Peaks Resort, along with professional project management from start to finish. In our view, the Best Sun Peaks Builder! 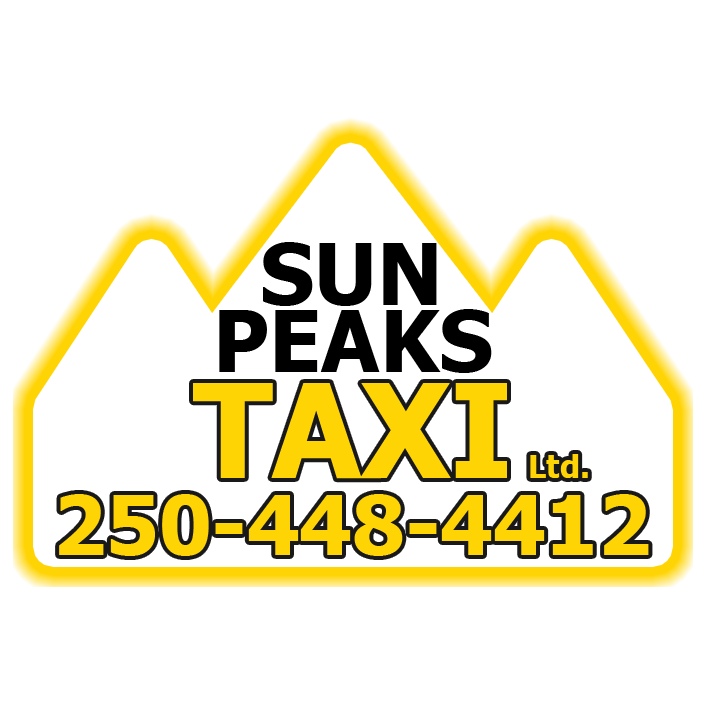 Sun Peaks Taxi service with airport, train, and bus transportation services to/from Sun Peaks, Whitecroft, Kamloops, Big White, Revelstoke, Whistler, and throughout most of BC. HouFY - there is a new site called HouFY (House For You), which provides an easy to use, unique and enhanced experience to list or find vacation rental properties. It is similar to VRBO/Homeaway and Airbnb, except better since there are no booking fees or communication restrictions, which will save you 10% or more. Houfy is easy to use and you can save money on thousands of properties around the world and book your vacation rental direct with the verified owners using this growing rental community platform. Lone Wolf Chalet at Panorama Ski Resort - a beautiful 4 bedroom ski-in / ski-out townhouse with beautiful views and a private hot tub. Sleeps up to 10 people, backs on to the Greywolf Golf Course, fully stocked and family-friendly, just like our BestSunPeaks condo! Book direct with them and save the VRBO fees. Luggage Forward - shipping luggage and ski gear with Luggage Forward is convenient, secure, and reliable. Luggage Forward's door-to-door luggage shipping service is easy, safe and guaranteed to arrive on time. You can breeze through the airport when you ship luggage to your Sun Peaks accommodation, hotel, cruise line, golf course, residence or office where it will be awaiting your arrival. Luggage shipping provides total travel convenience. Ship your skis, snowboard, mountain bike, golf clubs, etc. to/from your holiday destination and avoid the hassle and additional fees and related costs. World of BC – useful website about the many different attractions and travel opportunities around our beautiful province of British Columbia, as well as relevant wilderness knowledge . Laine Dagneau - mobile provider of quality, high-end hair and makeup services at Sun Peaks and other destinations within British Columbia.